Arrive in London at 9:00. Sit in plane for 20 minutes while they do whatever it is they do before letting you deplane. Collect baggage in speedy fashion. Arrive just after 10PM, visit pubs with Jamie. But we know what they say about the best laid plans. They go oft agley. 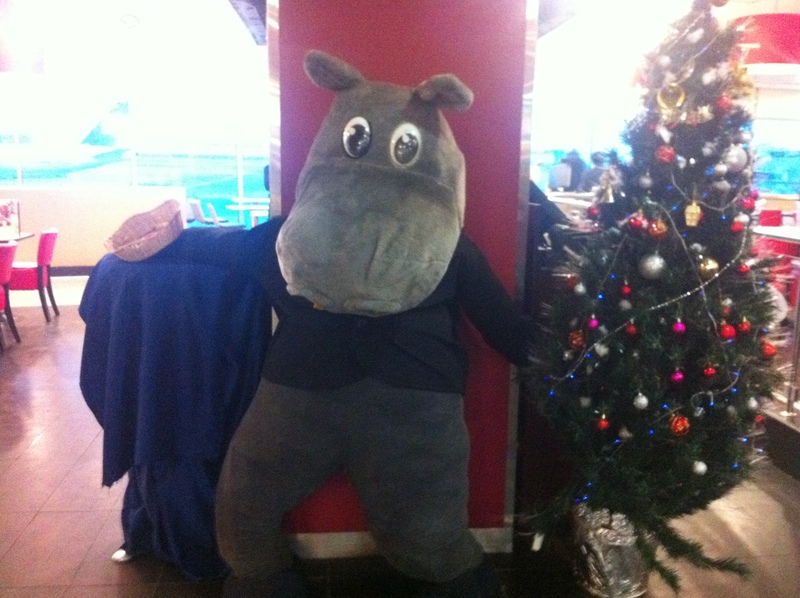 Cairo Airport was not itself on December 22nd. In fact, if the signs weren’t written in Arabic, I would swear I was somewhere else. Cairo is a city of noise. It is constantly trying to outdo itself in noisiness. You honk your horn, but someone honks louder, and the passing truck honks louder with its specially customized song horn. There was no one at the airport because all of the other schools sensibly sent their staff packing on Thursday, whereas our school thought it would be prudent to have students come on Sunday and Monday for two extra days of learning! Of course, my biggest class size was six, so I was feeling a little bit irritated. Luckily, Sally’s school was feeling senseless this year too, so I stood at the lineless London check-in waiting for her to arrive so we could sit next to each other. If you are traveling to B gates, please allow 15 minutes for arrival. If you are not able to complete this walk, buggy service is provided every 15 minutes. Only the Queen’s Terminal would require passengers to hump their baggage down five magic carpets, up two steep escalators, then down another two to reach their destinations. They should really provide a gondola. This is what Sally and I were up against at 9:45 on Tuesday night. Panting and glistening with sweat, we pushed past otherwise sleepy passengers just enjoying the moving sidewalks, their luggage spread out all over the place like moguls to be avoided on a ski slope. The escalators were worse. Moving stairs and floors have rendered otherwise practical people lazy and disengaged. Once they relinquish their autonomous mobility, they drop their things all over the steps and await the slow ascent to the next floor. There was no move-to-the-right etiquette so hurried travelers like Sally and me could get by on the left. There was much pushing and shoving to finally reach the immigration hall, which further punctured my I’m-going-to-an-English-pub-tonight! balloon. The lines for UK citizens were manageable. For non-UK passports, the line doubled back on itself three times. I joined the end of a particularly long and serpentine queue and waited impatiently to move forward. Leg sweat adhered my jeans to my skin. My hair felt oily. The breezy and glamorous Nicole who would stride elegantly through the streets of London had been replaced by a growling, smelly monster. It took nearly twenty minutes to pass through immigration, where I found my priority marked bag whirling the carousel in a state of neglect. I hefted the thing off and dragged it into a huge lift, where I spotted a colleague who had been on my flight. We were both off to the tube, him with a connecting train to the north at 11:30. I glanced at my watch. 10:40. In the ticket station, throngs of travelers crowded the kiosks. We managed to shuffle to a machine and punch in our zone destinations, but the machine was particular and refused to accept our cash and our cards. We joined the person line and received two tube tickets from a pleasant employee, pushed through the turnstiles, and managed to swing through the open doors of a waiting train. For the first time, I managed to exhale, my jumbo suitcase squeezed between my legs. Think harried traveler. Think Amazing Race. The reflection in the tube window was one of a crazed woman, wide-eyed and shiny-cheeked. Steve, my fellow suffering traveler, passed me a phone to call Jamie, who had been waiting at the hotel since 9. “I’m at Osterley,” I managed, catching my breath. “If it makes you feel any better, I’m probably going to miss my train home,” Steve offered. Once the train trudged into Earl’s Court, I dragged my suitcase out of the car, into the lift, and through the turnstiles, where I found Jamie waiting for me on the tube station steps, probably one of the best sights for my weary eyes, not just because he was kind enough to wait there for nearly an hour, but because he’d probably saved me an hour of wandering lost through Kensington with my stupid suitcase whose wheels often refused to wheel. The bonus? I freshened up in a quick minute at the hotel, and we found a Christmasy English pub that Jamie had spotted earlier just on the corner and managed two pricey pints of Fosters. It was exactly what I had hoped for: wreaths on the walls, evergreen garland winding around the poles, drunks squirming on bar stools. As if on cue, the man at the corner of the bar called the bartender over to complain about the reeling gentleman seated next to me, who was then promptly cut off and escorted out after a bit of a scene. He lingered on the sidewalk outside for some time. In English fashion, we were given plastic cups when the pub closed a half an hour later, and sent out onto the streets. The idea of drinking in the street was unusual and exciting. 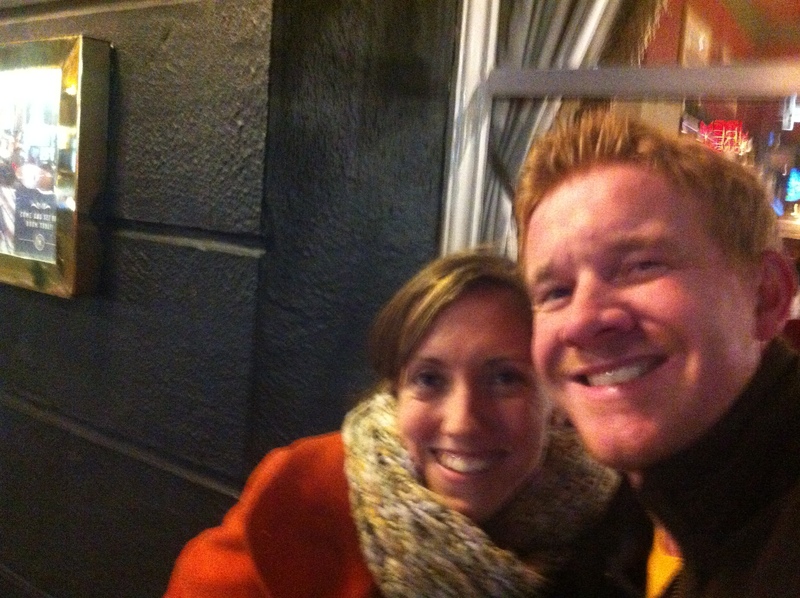 We stood outside the pub and inhaled the fresh, London air. Drunks sang in the street. Cyclists waved to their friends on the pavements (English for sidewalks). “Hey, Hugh! You out tonight?” called one man to a passing cyclist. “No, working tomorrow!” the cyclist called back jovially. Construction workers mingled outside the tube stop, sipping coffee from festive cups. A raggedy Irishman appeared before us and sang a few songs. It was exactly the kind of night I had been after. 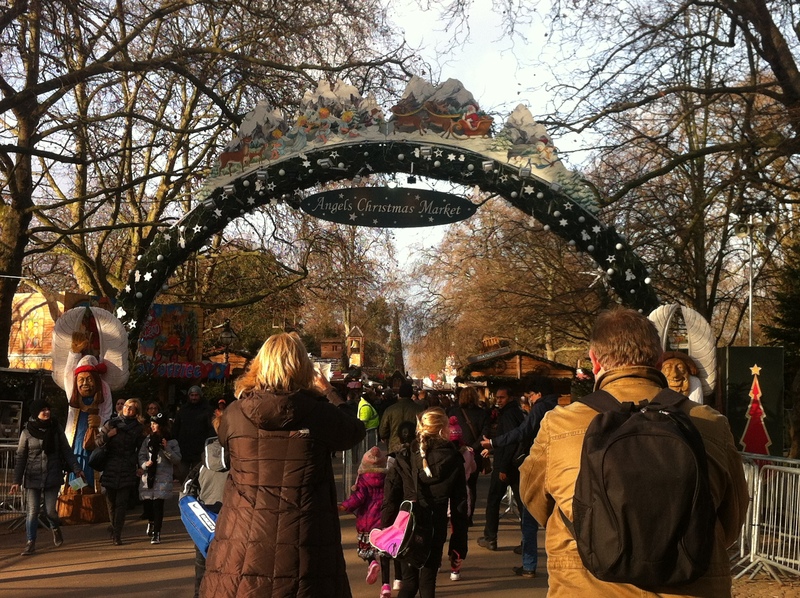 In the morning, after a tasty breakfast (at my favorite English hotel, the Premier Inn), we hopped on the tube to Hyde Park, where Winter Wonderland was in full swing. 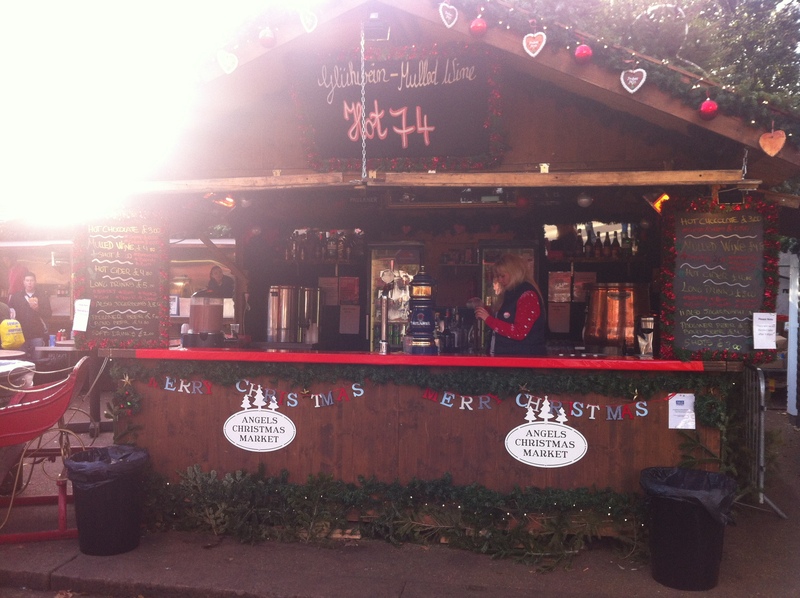 Inside, there were Bavarian beer gardens, vats of mulled wine, handcrafted gifts, and rides for children. 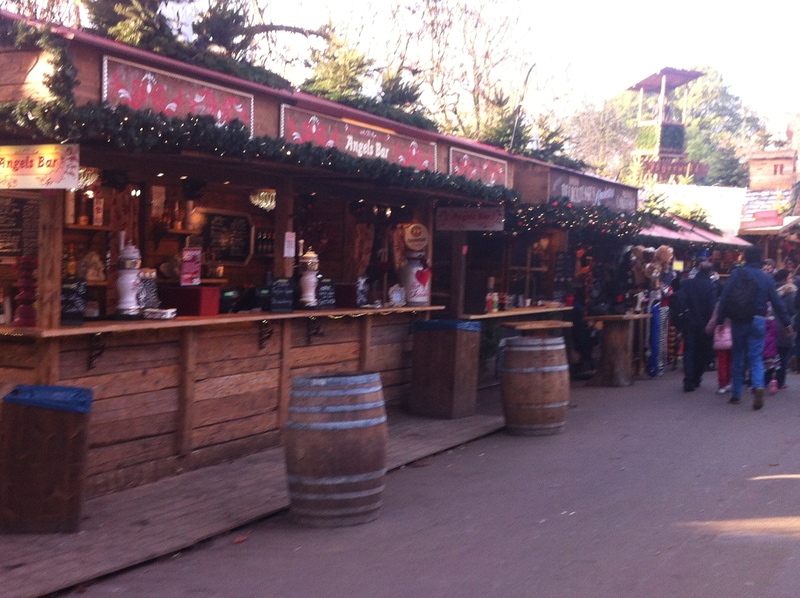 We spent two hours wandering through, buying last minute gifts and sipping hot mulled wine. Alas, my flight home was calling. It was back to the tube, a far more serene journey than the night before. New York is great, but London really knows how to do Christmas. Mulled wine, $7. Worth it? Yes.